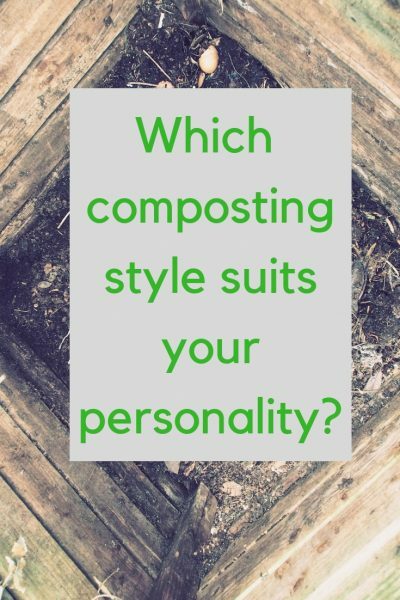 Is your personality better suited to easy compost or fast compost? When I started gardening, I was confused by what appeared to be conflicting advice about compost. There seemed to be very exact recipes for making ‘perfect compost’ or people who just threw everything onto a heap. Which one was the right way? Once I realised that there is an important difference between fast compost and easy compost, it all seemed much clearer. Different composting styles suit different gardens or personalities. Both create compost, but only fast composting – known as ‘hot composting’ – is likely to make enough compost to save you much money in a middle-sized garden. Here is a summary of the differences so that you can choose the right one for you. Easy composting is known as ‘cold composting’. It’s a convenient, environmentally-friendly way of disposing of garden and some kitchen waste. It saves you time and effort, and will provide some useful compost. A ‘cold composting’ heap will take at least a year to rot down, so unless you have space for several compost bins or heaps, it will only provide you with some of the compost you need. I think it’s difficult for a middle-sized garden to create enough compost for its own needs anyway. 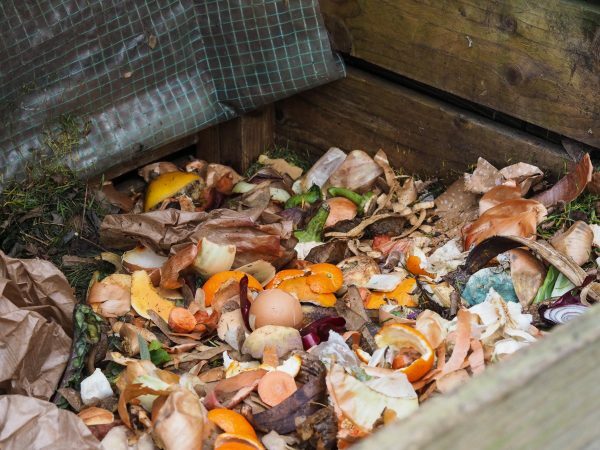 Compost rots down to less than a third of its volume, so however many clippings and peelings you add, there is rarely enough once it’s rotted down. But there are other advantages to composting – you won’t have to take all your garden waste to the local tip or pay the council for a ‘green waste’ bin. It’s an environmentally sound thing to do. Our garden is around 100ft long and 80ft wide at its widest. We try to compost as much as we can. Small branches and twigs are cut up for the fire. But we do still take some garden waste to the dump – we don’t compost weeds and some clippings are too dense and twiggy for easy composting. Fast compost is known as ‘hot composting’. ‘Hot composting’ will give you good, usable compost in weeks or months, so you’ll be able to make much more compost every year. Some hot composting methods – such as using a Hotbin or Thermocomposter– mean you can also compost all household food scraps, including meat and fish. But all fast composting needs you to monitor the balance of ‘green’ and ‘brown’ waste and to check the temperature. You also need to shred larger elements (such as cardboard). If you have a ‘hot’ compost heap or bin, you’ll need to turn it at specific intervals. Your bin will need to be a certain size. But you can compost weeds in a hot system because the heat kills the roots and seeds. It’s not difficult, but it doesn’t suit everyone. Does home-made compost save money? With three compost bins, I’ve estimated that cold composting gives us about 750 litres of compost around once a year. Depending on how and where you buy your compost, that would cost you £60-£120. 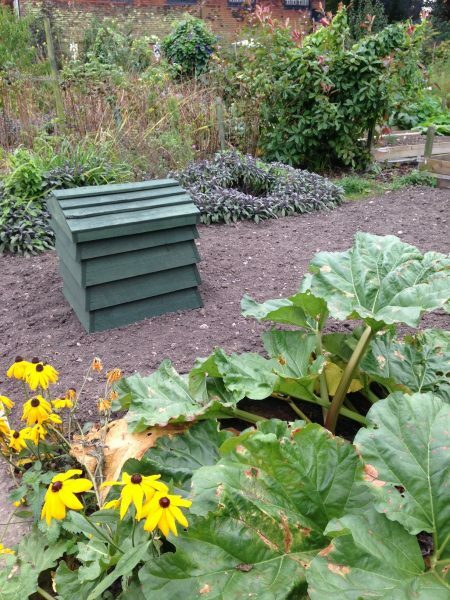 A ‘beehive’ composter at the Abbey Physic Garden. You might expect two or three times as much compost from the hot composting method, but you would have to spend more time doing it. Julie Quinn, who writes the London Cottage Garden blog, has two small beehive composters for her garden, which is about 50′ square. She estimates that it saves her around £50 a year on compost. Hot composting turns waste into compost quickly because the microbes that break down compost are given the ideal conditions in which to work. I don’t do ‘fast compost’ so I’ll direct you to those who do. The YouTube channel Grow Veg has a very clear video on the Perfect Compost Recipe. And blogger The Propagator has trialled three different fast composting heaps. His post has good resources for those who want to learn hot composting. Easy composting – called ‘cold composting’ – is very easy. The principle is that everything breaks down eventually. It just takes time. Expect it to take 1-3 years to go from garden clippings to compost if you’re using the ‘cold composting’ method. And it’s all a question of degree. Your ‘cold’ compost heap will rot down more quickly if you chop everything up, for example. My ‘cold composting’ heap. It takes about a year to 16 months to rot down. Similarly you don’t ‘have’ to turn a cold compost heap. It’ll probably be better if you do, but if you have a bad back, then don’t worry about it. Your compost will just take longer to rot down. So you can borrow some of the rules from hot composting to speed up cold composting. Read this post for more detail. Which bins for the easy version? If you’re cold composting then the size of the bin is less important. But it’ll compost down faster if you go for the best composting size (from 3ftx3ftx3ft to 5ftx5ftx5ft). We bought three self-assembly wood compost bins from Amazon. Each one holds about 700 litres of compost when full. Beehive composters hold about half that amount. Our wooden bins have a pull over plastic cover. Note: Links to Amazon are affiliate links, which means I may get a small fee if you buy. It won’t affect the price you pay. I asked fellow gardeners on Twitter about their compost bins and habits. @SPajwani of the 2 acre St Timothee garden in Berkshire (open for the NGS). has a system of wooden bins and says ‘everything goes in and there’s no turning or doing anything. It’s ready in about three years.’ They do have a shredder, however. Other cold composting bins include bins made from pallets (vlogger Lovely Greens has a good how-to video), breeze blocks, tractor tyres with the middles cut even bigger, chicken wire and corrugated iron. Teacher @StevieDufyn uses old green plastic butts, which create an informal ‘hotbin’. She says she puts in kitchen waste and shreddings and leaves it. This gives her compost in a few months. JenAckroyd has a compost pile at the base of an apple tree. She says that it improves the flavour of the apples. Jen also has a Hotbin. Quite a few people do more than one kind of composting. What can you add to a cold composting heap? 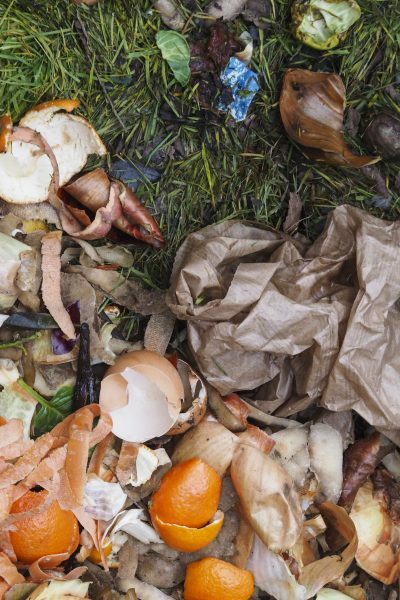 There are so many myths about what you can and cannot put in a compost heap. If you’re doing a fast ‘hot’ method, then you really can probably put in almost everything, including cooked food and weeds. I have checked and re-checked this. 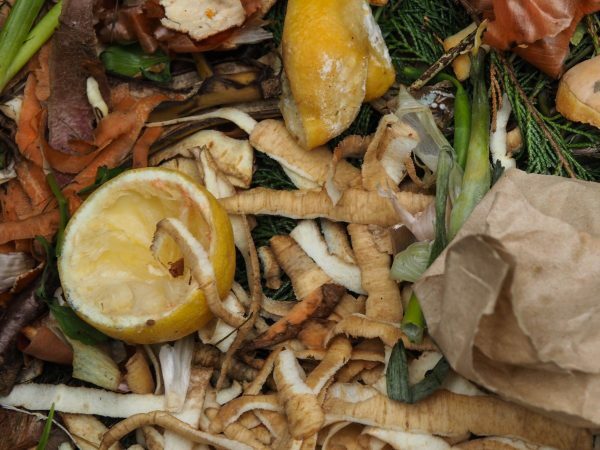 You can add all uncooked veg and fruit peelings, grass clippings, paper, wood, cardboard, twigs and shredded wood to a cold compost heap. Julie Quinn adds ‘fluff from the Dyson, and wood pellet used cat litter which has become like sawdust.’ She removes the cat faeces first. If you have non-carnivore pets, such as hamsters or rabbits, you can add their soiled bedding in its entirety. People say you can’t put citrus fruit in. ‘No dig’ guru Charles Dowding has 30 years of composting behind him. He says you can. There are always a few citrus fruit peelings in my compost bin, but it’s such a tiny proportion of what goes in – it doesn’t make any difference. You can also see a few Cyprus Leylandii clippings. Charles Dowding and other experienced composters say that you don’t need to worry about them turning the compost acid, but that they do take longer than most things to compost down. Chop up small and allow around 3 years. Others say you can’t put in grass clippings, but if you add torn up newspaper or cardboard, it should be fine. We have a firm of accountants near us. They shred all their documents. The bags are picked up on Thursday mornings. So I asked if I could take a bag when necessary and I use that to balance out grass clippings. Lots of people shred leaves or clippings by laying them out on the lawn and running the lawn mower over it all. I haven’t tried it myself, but am tempted. Let me know if you have any other composting tips in the comments below. This week’s video is part 2 of my ‘plant heroes’. These are plants that are very easy to look after and will look good for months on end. 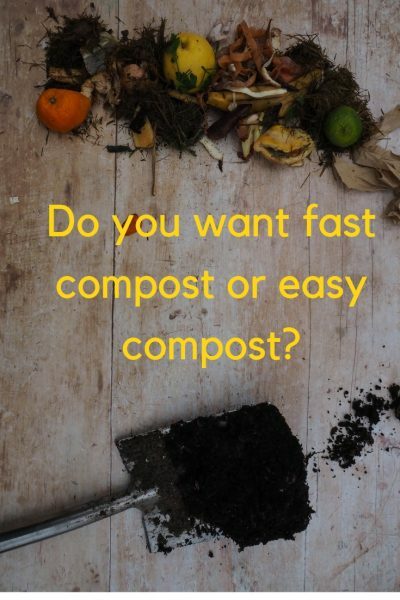 9 comments on "Do you want easy compost or fast compost?" Hello and thanks so much for sharing. This is really great information on composting. Composting is so great and can really help garden plants off to a good start helping them to grow healthy and strong. Thanks for this clear and practical post (as always). The only thing I would add is to keep your compost moist. In last year’s heat mine got too dry, and although it did turn into decent compost, I discovered a rat’s nest in the middle, which was a bit of a shock, particularly to the rats! Oh dear, rats do seem to be everywhere. I try to pretend not to see them. Thank you for your suggestion! One advantage of an open topped slow compost heap is that it provides great habitat for slow worms and common lizards. Thank you for the very helpful post – it has cleared up a lot of my confusion. I had been considering starting a compost pile a couple of years ago but had found all the rules and conflicting advice a bit of a minefield. If only I had – I would have had some nice compost by now! Could I just ask whether you add autumn leaves to your cold compost pile? I add some autumn leaves – chopped up by the lawn mower is good. Otherwise I just rake the autumn leaves onto the bed where they help protect plant roots from the cold and offer some sheltering to over-wintering insects. I thought the leaves would blow around the garden again if I did that, but so far they haven’t (that’s the experience of three winters, which is how long I’ve been doing it). Perhaps if you lived in a very windy area, they might blow about more.But it’s probably worth a try as raking them into the nearest border is definitely less work.